Edwin Rossow, professor emeritus of civil and environmental engineering, passed away on February 5, 2017 at age 80. Known as “the students’ professor,” Rossow will be remembered as a dedicated teacher and caring mentor. Born on June 10, 1936, Rossow grew up in Plymouth, Michigan where he decided to become a civil engineer before he even graduated high school. This decision was partly influenced by watching his father, who was a carpenter and residential contractor. As a first step toward attaining his career goal, Rossow entered a five-year program of study — three years at Carleton College in Minnesota followed by two at MIT, where he subsequently earned his PhD in 1964. 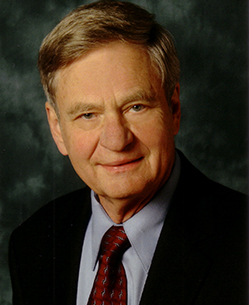 In 1965, Rossow joined Northwestern’s Department of Civil Engineering, where he specialized in computer methods for the analysis and design of structures. His research contributed to significant advances in structural analysis, steel design, and the behavior of reinforced concrete. Rossow even quite literally wrote the book on these topics; in 1996, Prentice Hall published his textbook, Analysis and Behavior of Structures. While Rossow was an esteemed researcher and scholar, he most enjoyed teaching and interacting with students. He taught a total of 19 different courses at Northwestern, five of which he developed and introduced into the department’s offerings. His courses were perennially popular among students, who were drawn to Rossow’s enthusiasm and dedication to their success. He demonstrated a very real, personal commitment to each student, readily taking time out of his busy schedule to meet with them outside of class. When Rossow was nominated for the Charles Deering McCormick Professorship of Teaching Excellence in 1992, several of his former students wrote supportive letters on his behalf. Not only did Rossow receive the Charles Deering McCormick Professorship, he received every possible teaching award given to Northwestern professors, including the Civil Engineering Department Teaching Award, multiple ASCE Student Chapter Teaching Awards, Tau Beta Pi Teaching Award, Technological Institute Teaching Award, Northwestern University Alumni Excellence in Teaching Award, and the first-ever Technological Institute Advising Award. The Chicago Tribune also named Rossow to its annual “All-Professor Team.” As a lasting tribute, Rossow’s students honored him by endowing the “Rossow Prize,” which recognizes outstanding seniors who demonstrate high potential for professional success in the field of structural engineering. In addition to recognizing Rossow’s enthusiasm and dedication to teaching, these many awards acknowledge his contributions to innovative teaching methods and his ability to foresee the evolution of his field. In the early days of computer programming, for example, Rossow was dissatisfied with the commercially available software to supplement his lectures. So he meticulously designed his own software programs to perform not only tedious calculations but to serve as an interactive tool for students to learn basic concepts. His work in educational software development helped the department establish one of the avant-garde microcomputer facilities of that era. Rossow’s love for teaching extended well beyond Tech’s classrooms. For many years, he managed Northwestern’s National High School Institute program for science and engineering. In that capacity, he welcomed, advised, and served as a role model each summer for a group of 70 to 100 high school seniors. Under his direction, the program grew nearly 50 percent with no additional funds. His colleagues attributed this growth to Rossow’s encouraging attitudes toward applicants, attracting in more self-funded participants to the program. Aside from his teaching and research contributions, Rossow gave his time and service to his community. He served on the Village of Wilmette’s school board and zoning board and volunteered for the Boy Scouts of America and numerous professional committees. Rossow is survived by his wife, Barbara; daughters Cathrine (Jeff) Cunningham of Urbana and Laura (Clint Finger) Rossow of Seattle; son David Rossow of Seattle; and grandchildren Michael Cunningham, Matthew Finger, and Katherine Finger. He was preceded in death by his first wife, Janet. A memorial service to honor Rossow’s memory will be held at 10 a.m. Saturday, May 13 at Alice Millar Chapel in Evanston.